Carwarden Community School in Surrey is a community special school for pupils aged 11-19 with moderate learning difficulties. Sleuth was introduced after an Ofsted inspection identified that “behaviour information was not being used to bring about improvements”. 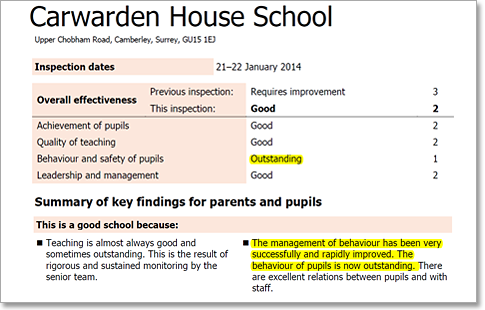 Within months, Ofsted’s judgement of behaviour went from Requires Improvement to Outstanding. Headteacher Jarlath O’Brien1 explains the dramatic turnaround. “It was clear that we didn’t know the information ourselves. The process itself did the work for the inspector, it proved to him that we weren’t on top of it at all. “The solution had to be something that was quick and easy for the staff to use. It’s got to be in their interest to want to use the system, because if it’s overly bureaucratic they’re going to stop using it and you’re wasting your time. The ease and efficiency of Sleuth convinced staff that it’s not going to swallow up their time, they know it’s worthwhile and they will be supported by the leadership team because someone, very quickly, is going to spot if there’s an issue and will act on it. We’ve shared information with staff to show them how things are going, to give them the professional confidence to know that what they’re doing is leading to meaningful improvements within the school. Sleuth’s been central to that, because staff would get out of the habit pretty quickly if they felt they’re churning data for the leadership team and nothing is happening or improving, or worse, it’s continuing to deteriorate. “I had that confidence because Sleuth is set up in an efficient way for us to give us the information we want, when we want it. “That gave a very clear message to the inspection team, that we hadn’t just bought something off the shelf; we developed something in Sleuth that was bespoke to us, that suited us as a school, that supported our policy. The information was there, solid, robust, and at our fingertips. They could see that we were using it in day-to-day practice and our evidence was strong enough to support an outstanding judgement. “Sleuth has been very responsive to our needs, there isn’t another school that is set-up like that because it fundamentally reflects the policy we have in the school. It’s very easy to want to buy something off the shelf that you can use tomorrow, just because you want to get started with something. That time that we invested and you invested in us to try and work out, “What is this school all about? What’s it trying to do? How can this support what it’s trying to do? How can it actually be meaningful?”, was time really well spent. Sleuth supports our school vision in the best way possible. 1 Jarlath O’Brien is now Director for Schools at the Eden Academy Trust.